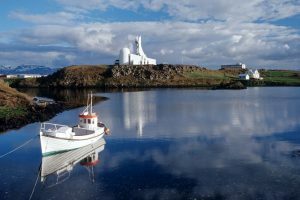 We head out to the Reykjanes Peninsula with its hot springs, mountains, bird cliffs, lunar landscapes and fishing villages. Our first stop is the famous Blue Lagoon, where we get to soak for about 2 hours in the warm mineral-rich waters. After a lunch break, we continue to Grænavatn, a small green lake in a very deep explosion crater. Next, we explore Krýsuvík, an area with solfataras, fumaroles, mud pots and hot springs. The soil is coloured bright yellow, red and green. 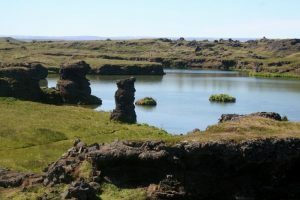 We travel towards the south through large lava fields, along with mountains and the Atlantic ocean. Around 5 pm we take a short ferry ride to the Westman Islands and stay for one night at Hotel Vestmannaeyjar. Welcome drink & dinner is included. Today we explore the town of Heimaey and this extraordinary island by foot and by car. The volcanic eruption in 1973 is considered the largest natural disaster in Iceland in recent history. The eruption began on January 23 in the outskirt of the town of Heimaey, the only populated island in the Vestmannaeyjar archipelago. After the evacuation of the 5300 inhabitants, and during the 5 months while the eruption lasted, there was much uncertainty as to whether or not the island could ever be repopulated. 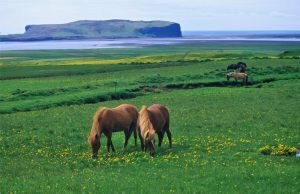 During our tour to the Westman Islands, we explore bird cliffs, walk up a volcano crater and visit “Pompeii of the North”, a volcanic excavation project. There you observe a “house” which was dug up from the thick layer of pumice after 40 years. There is also an exhibition about Surtsey Island that was born by volcanic eruptions between 1963-68 and preserved today by UNESCO. You have the afternoon free to wander around the town of Heimaey, with its birds and signs of recent volcanic eruptions. We travel with the 4 pm ferry back to the mainland and a long bus journey takes us to the Vatnajökull National Park, where we stay for two nights. Tonight a 3-course dinner is included. We start the day with a visit to the Jökulsárlón glacier lagoon, one of the most beautiful and dramatic spots in the whole of Iceland, and enjoy an amphibian boat ride among floating icebergs. Huge pieces of ice calve from the glacier and end up floating in the lagoon and out to sea. Many of you might recognize the glacier and ice lagoon from films such as Lara Croft: Tomb Raider and James Bond: Die Another Day! We also take a walk alongside the lagoon and on the black sandy shores, called Diamond Beach, and look for seals and stranded icebergs. 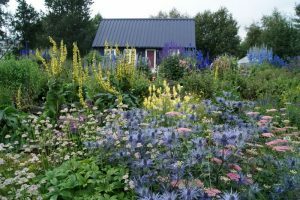 In the afternoon we visit the tiny turf church at Hof and spend time at Europe’s second largest national park, which has Iceland’s highest mountains, an alpine environment, and Europe’s largest glacier. We hike up to the waterfall Svartifoss, which is surrounded by black basalt columns. From there we walk to Sjónsker cliff, where we have a magnificent view of Hvannadalshnjúkur, Iceland’s highest peak with 2110 meters, and the area that was flooded during an eruption under the ice cap of Vatnajökull in the year 1996. The area has a lot to offer for nature lovers. Overnight at Vatnajökull National Park. Dinner on your own. Fjaðrárglúfur Canyon is an amazing and spectacular gorge and has the WOW factor. There is an easy walk on a good path to the right of the gorge, taking you up high to the top end of the canyon. There are spectacular views at several places on the way. The scenery is breathtaking. The next stop is the Vík in Mýrdalur, which is the southernmost village on the Icelandic mainland. The area has a rich birdlife, including puffins, fulmars, and guillemots. The world-famous Reynisfjara shore, near the village Vík, is widely regarded as the most impressive black sand and pebble beach in Iceland and features an amazing cliff of regular basalt columns resembling a rocky step pyramid. Out in the sea are the spectacularly shaped basalt sea stacks Reynisdrangar. According to folklore, two night-trolls attempted to drag a ship to land but were turned to stone as daylight broke, turning them into the Reynisdrangar stacks, clearly visible from the beach. Further west we reach the 62-meter high Skógafoss waterfall. We travel along the famous Eyjafjallajökull glacier and volcano and visit the narrow and 65-meter high Seljalandsfoss waterfall with a trail that leads behind the fall – but you must be prepared to get wet! We end the day at the new and interesting Lava Centre, an interactive, high-tech educational exhibition depicting volcanic activity, earthquakes and the creation of Iceland over millions of years. For the next two nights, we stay in a 4-star hotel in South Iceland. Dinner on your own. 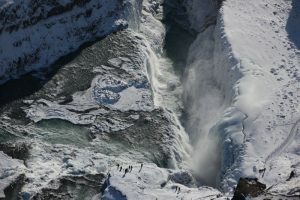 We start the day by exploring Gullfoss, the beautiful double “Golden Falls” that tumbles 34 meters into the Hvítá river and attracts tourists and travelers all year. Our Iceland tour takes us into the Icelandic Highlands, somewhere in the middle of nowhere and where not too many tourists go. 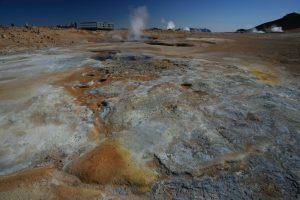 The Kerlingarfjöll rhyolite mountain massif is colourful and rich in contrasts with its peaks and valleys, glaciers and snowfields and all that lively geothermal activity. This colourful nature pearl is tempting both hikers and photographers alike. We hike about 2 hours and discover fuming steam vents, boiling mud pots and hot streams close to snow and ice. 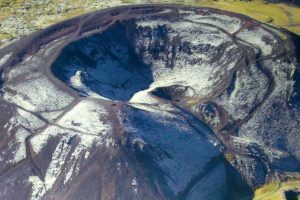 Once a year, Italian researchers and cryptographers come to Kerlingarfjöll to search for ancient manuscripts and “the Holy Grail” which by the story was buried there in 1217. In the evening we visit the active geothermal area of Geysir, where we can see Strokkur, “the churn”, spout up to 25 meters (70 feet) every five to ten minutes. Overnight in South Iceland. Dinner on your own. 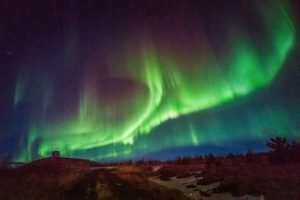 In the morning we travel to Þingvellir National Park, a UNESCO world heritage site, and an area of exceptional geological and historical interest. The gravel mountain road Kaldidalur takes us to Húsafell in West Iceland for a once-in-a-lifetime tour to visit the man-made ice tunnel and caves located on one of Europe’s largest glaciers, Langjökull. The caverns are composed of an extensive system of tunnels and chambers that stretch close to 300 meters into the solid ice cap towards a breathtaking natural ice cave at the heart of the glacier. Making your way inside the glacier you are able to explore various nooks and chambers and see a huge ice crevasse. As you walk further along the tunnel, the ice gets older and its colour gradually changes from white to deep blue, and also the acoustic changes. The trip includes an 8-wheel drive monster truck expedition on the glacier. 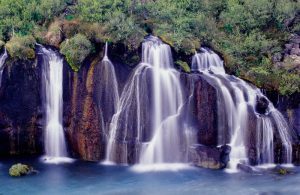 In the afternoon we visit the magnificent Hraunfossar and Barnafoss waterfalls. The water seems to magically appear from underneath the lava cascading over a long and moss-covered lava wall, falling into a bright turquoise-coloured river which is meltwater from Langjökull glacier. Our final stop for today is at Deildartungahver, Europe’s most powerful hot spring in terms of volume of water produced. The water that flows here is boiling and sizzling, quite unique. We travel along Hvalfjörður fjord and reach Reykjavík in the evening. Overnight in Iceland’s capital and farewell dinner in a downtown restaurant.